I remember my mom peeling truckloads of Gaajar , then grating them(sometimes with our help or sometimes all by herself) and then magically transform them into most amazing Gajar ka Halwa in a big big kadai!!!! And then all of us devouring that halwa, sometimes piping hot, sometimes cold. 1) In a thick bottomed pan add ghee, once it turns liquid add the grated carrots and saute for 3-4 minutes. 2) Add milk to the pan, ensure that all the carrots should be submerged into milk. 3) Add fresh cream, almonds, cashew and kishmish and mix thoroughly. 4) Now, keep stirring and cooking on low flame till all the milk evaporates. May take upto 2 hours. 5) Now add sugar and mix well, cook on medium flame till the water from sugar evaporates. 6) Add Elaichi powder, mix well and Viola!!! The Halwa is ready!!! 1) There are different methods of making this halwa.You can add khoya or condesed milk and cook carrots in pressure cooker or microwave. 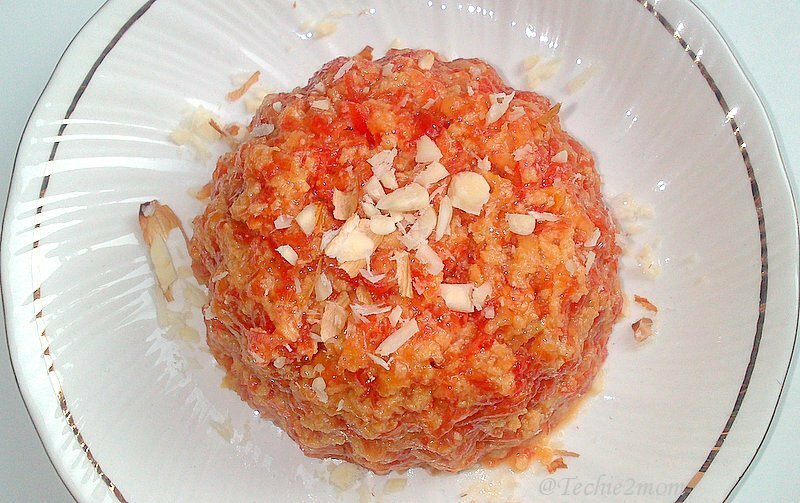 But for me nothing beats taste of this halwa, where the carrots are cooked in the milk directly….Heavenly!!!! 2) You can make it and store it in fridge for up to a week. I am sure you must be able to freeze it, though never tried it. 3) Even without sugar this tastes good. so if you want to avoid sugar you can do that by reducing the amount of sugar or by completely skipping it. Previous Post: Chocolate sponge cake…..